I seriously HAVE caught up on Journal 52. 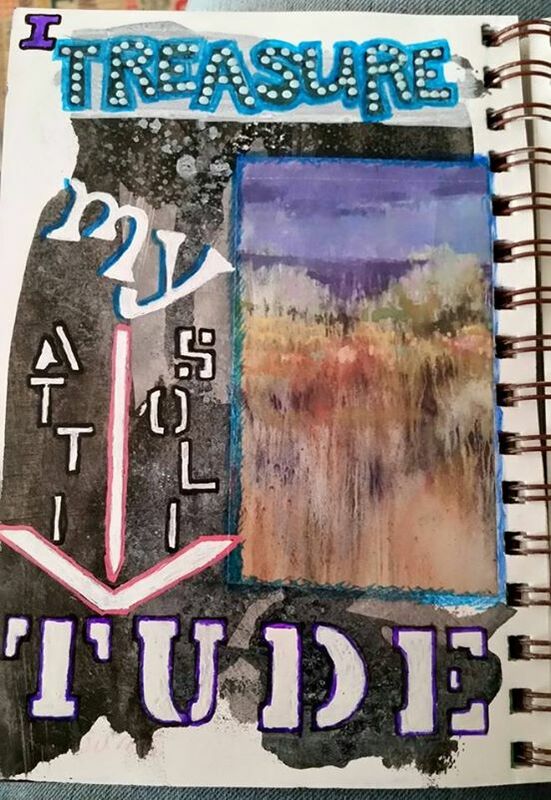 Week 17 – Treasure – The usual, acrylic, paint and gel pens, stencils and a random piece of junk mail. Week 19 – Outside in. 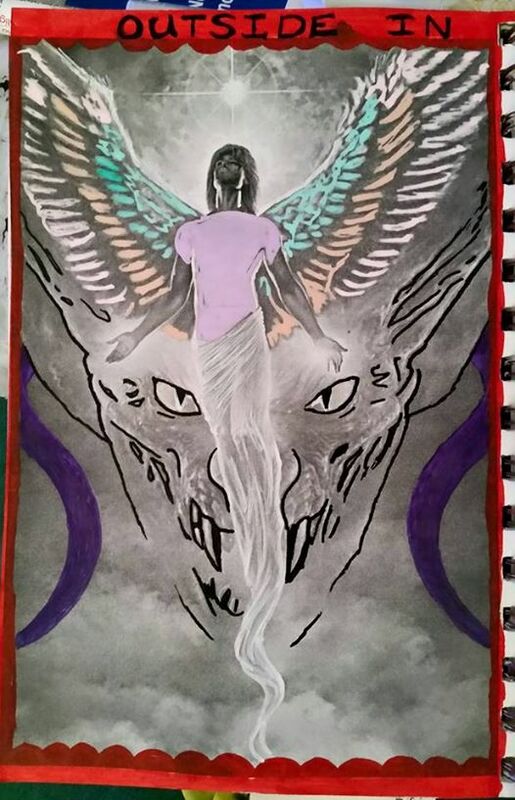 This is a random photocopy of a sci-fi illustration that I colored with gel pens and too much imagination, I think. Week 21 – Top 10 Lists. 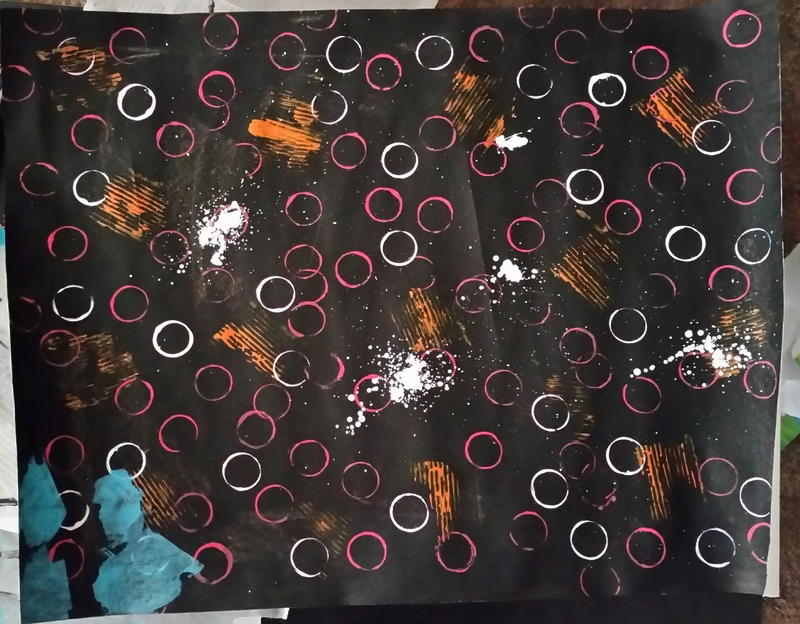 Acrylic, gel and paint pens, stencils and glitter paint. It’s pretty cool what I can get done while binge-watching Dr. Who! 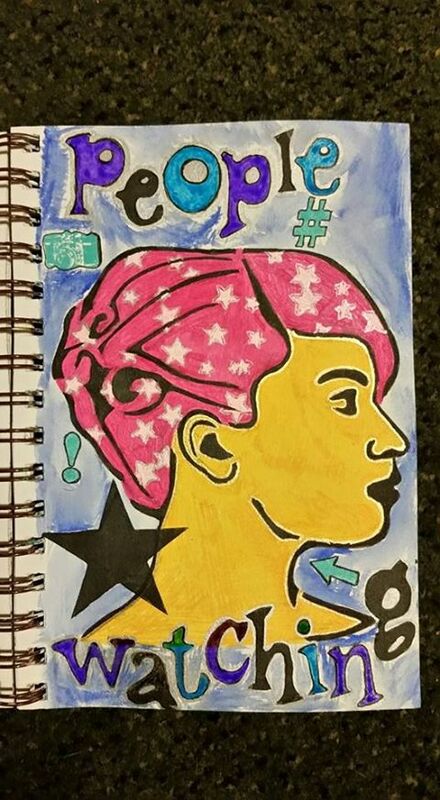 This entry was posted in Art Journal and tagged Journal 52. I finished four (4!) 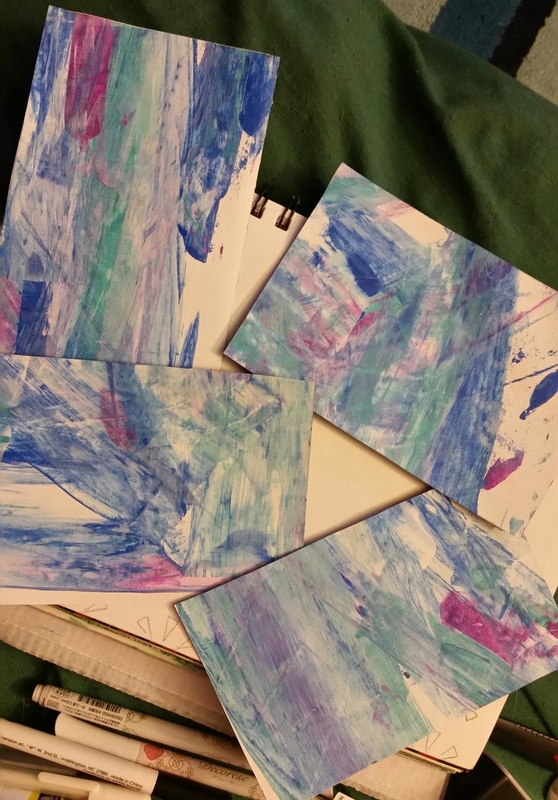 pages for Journal 52 over the weekend! 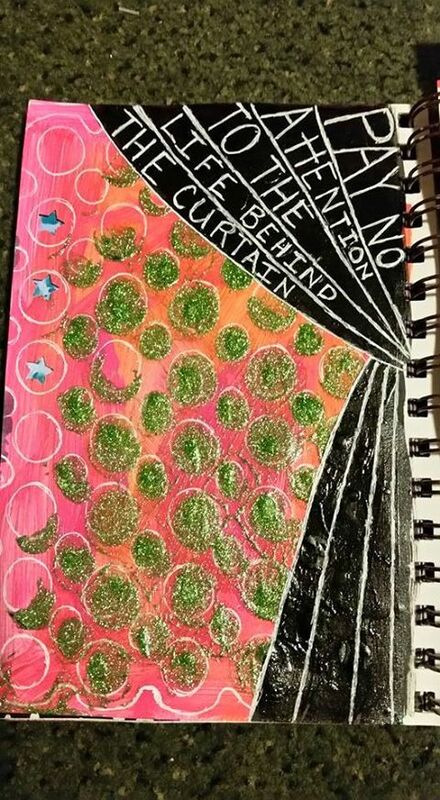 I was playing with some Folkart glitter paint I found on clearance and then went with it on this one. 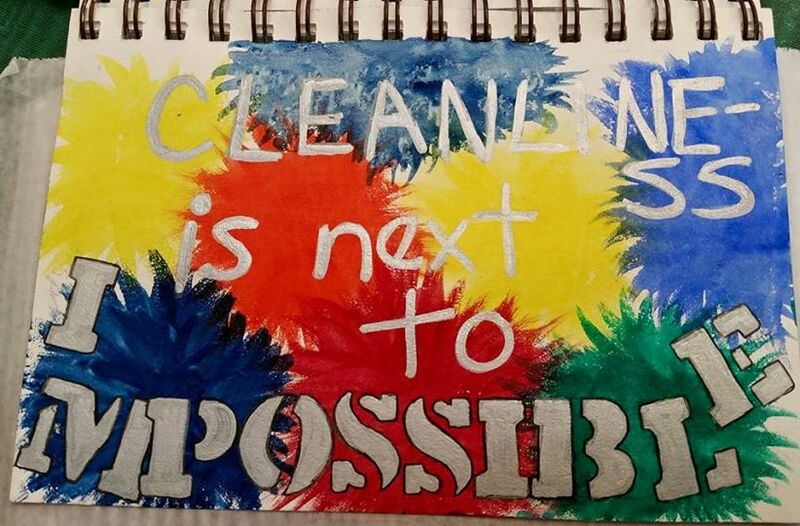 Week 13 – Spring Cleaning. Week 20 – Good Advice. 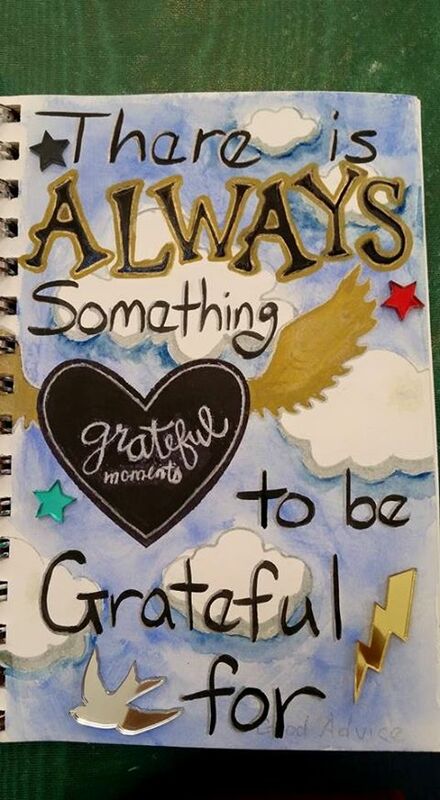 This is some of the BEST advice I have ever taken to heart, and I had fun with watercolors again! So…If I can finish two (2) more pages before the new prompt comes out on Friday, I will be caught up. .I just got home from a road trip to Fresno (8+ hours each way) and I’m wiped, but I wanted to post the pages I finished last week. Week 8 – Aromatherapy. BIG surprise…It’s coffee! The smell of coffee is one of the BEST scents in all the land. Week 15 – Cards. I had thought of using lotteria card for this but that would involve locating them in my stash…heh. 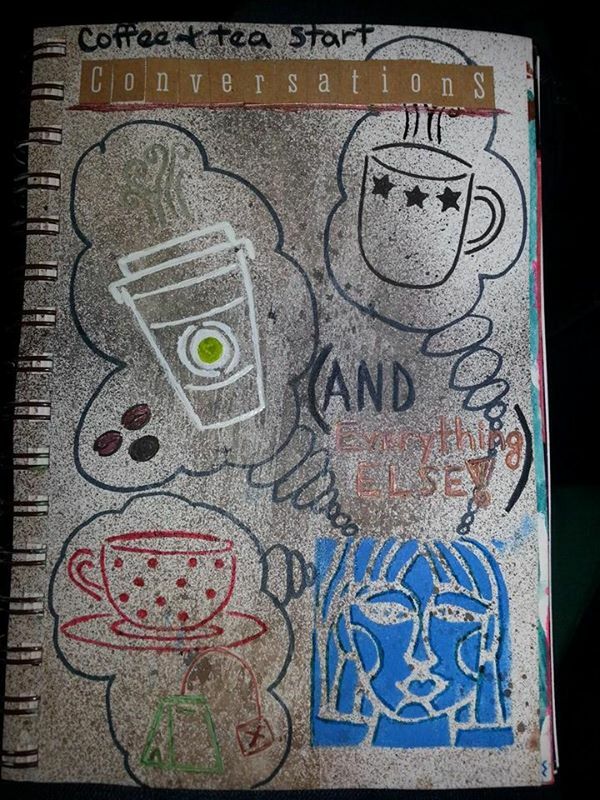 Both of these pages were finished during my monthly day-long-boring-as-hell training at work. I do what I can to keep from fidgeting all day (and stabbing people out of boredom). 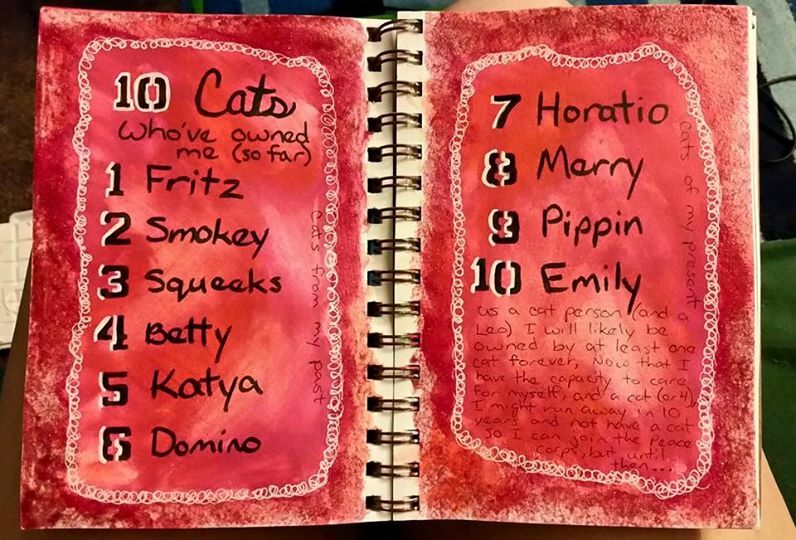 I am getting close to being caught up with the Journal 52 prompts and I hope to get to some more by next weekend when I go up to a cabin near Julian with some friends. No interwebs & no cells for 2 DAYS! I’m putting together little art bags for both of them so they can play too! Finished 2 more pages over the weekend… I had sprayed two pages with walnut and java ink a few weeks ago and planned to extend this “conversation” page. The background ended up being darker than I had anticipated. It was difficult to add color on top of the spray. 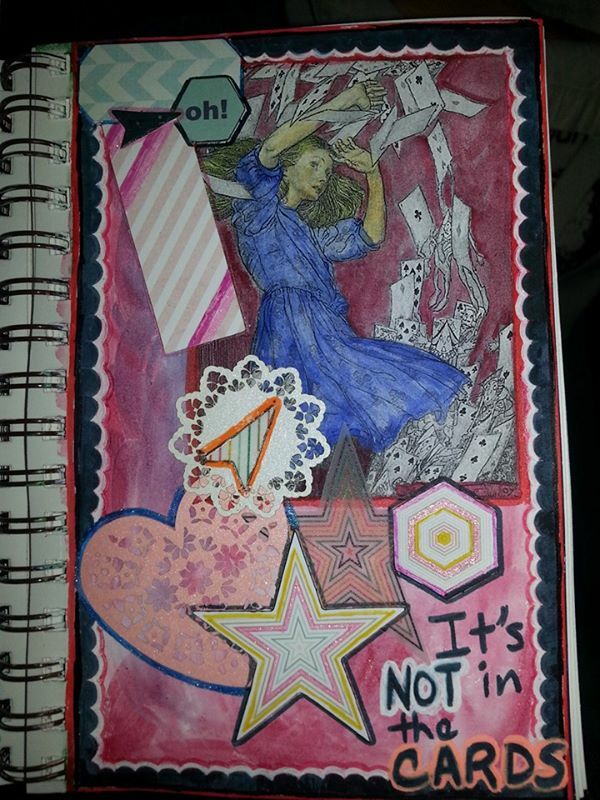 Live and learn in Art Journaling! 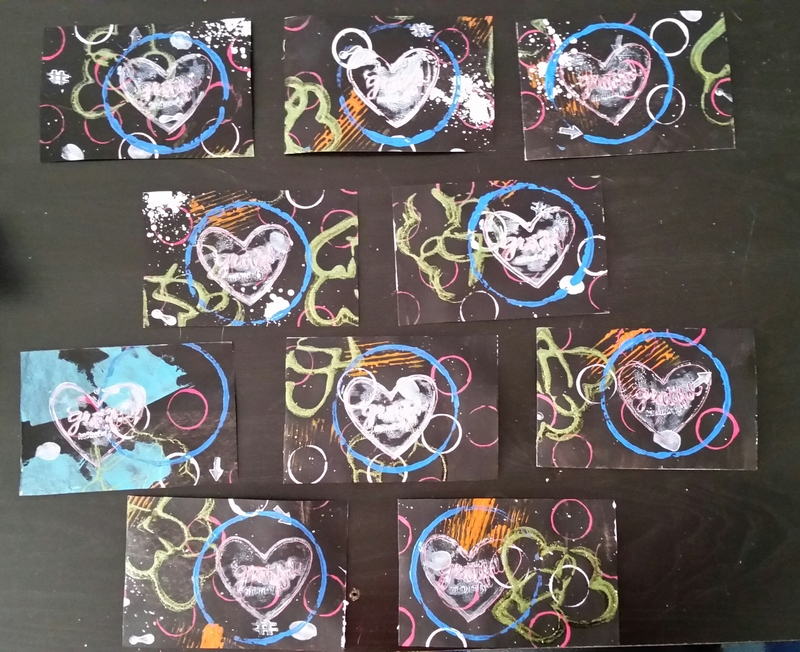 Stencils, paint, gel and sharpie pens over walnut and java spray inks. 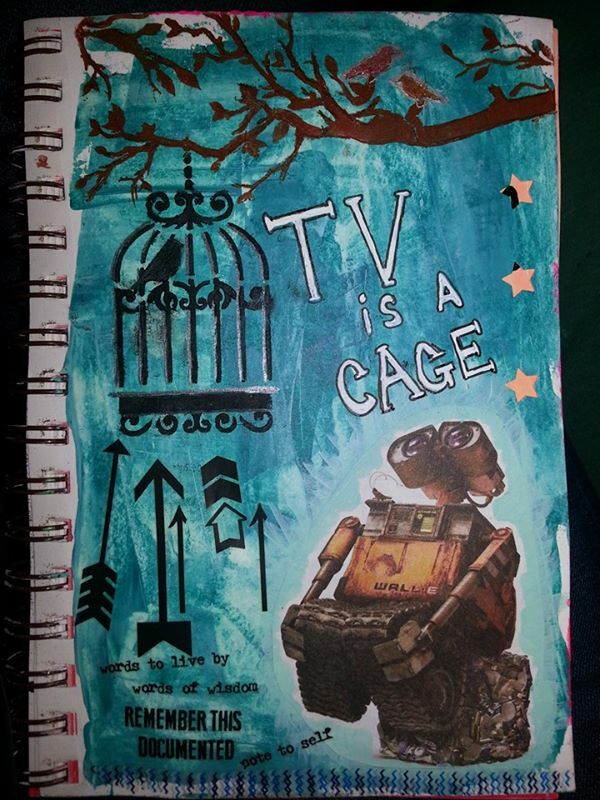 Did discover an art supply that I DO NOT like for Week 5 – Television. I used Folkart stencil crème with stencils to add the tree branch and the bird in the cage and, over a week later, that black is STILL not dry. I picked this stuff up on sale, thinking that it would be more portable and useful when I journal out in the wild, as I am wont to do. 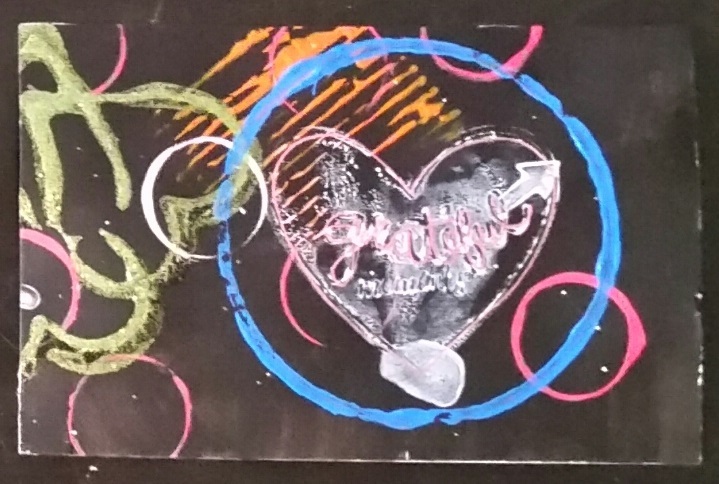 This has a an acrylic paint background, a picture from an advertisement, stencils and CRAPPY paint, rub-ons, and gel & paint pens. The subject matter, television. is something I had struggled with until I had my cable turned off…now it bothers me not at all. I have Netflix and such for whenever I want to watch something but it’s never on as “background noise” and I don’t get sucked into crap I don’t care about. I don’t really miss it. Yay me! More time to get artsy and that makes me happier than the “idiot box” ever could. 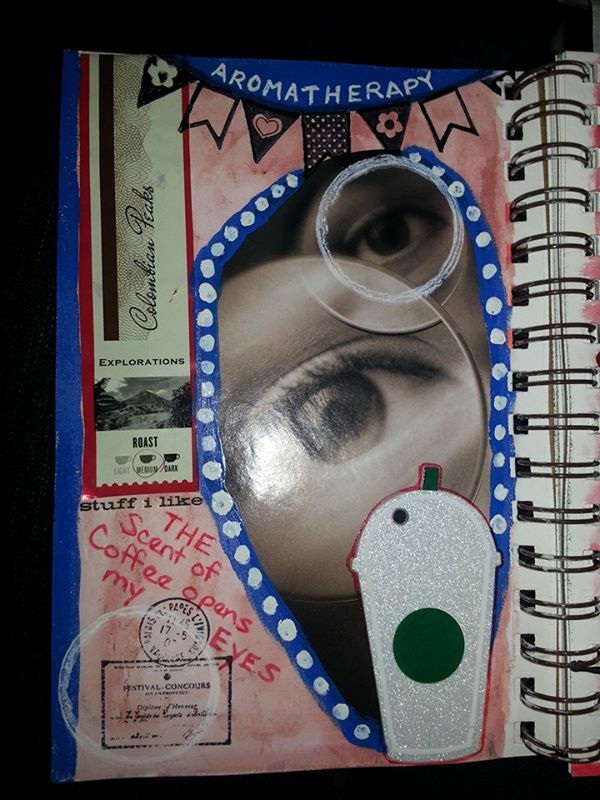 This entry was posted in Art Journal and tagged Journal52.